The World: Born in 4004 BC? The age of the earth is one of the most contentious issues in the creation/evolution debate. In today’s culture, the thought of creation occurring about 6,000 years ago is frequently mocked by non-Christians—and also by many Christians. Even James Ussher (1581-1656), the famous and respected Archbishop of Ireland in the seventeenth century, is today greatly ridiculed for declaring that the world was created in 4004 BC. However, this date was widely accepted until people began to believe in ideas such as billions of years of Earth history. In other words, they started trusting in the latest secular findings based on fallible dating methods, instead of the only absolutely reliable method—consulting the history book provided by the Eyewitness account (the infallible Word of God). Ussher also argued that Day 1 of creation was October 23. On the surface, this does seem a bit extreme to suggest such a specific date—but when one studies what Ussher did, one quickly realizes he was a brilliant scholar who had very good reasons for his conclusions concerning the date of creation. Studying Ussher’s line of thinking as he arrived at his conclusion—creation on October 23, 4004 BC—provides food for thought to this very day. In preparing this work, Ussher first made the assumption that the Bible is the only reliable source of chronological information for the time periods covered therein. In fact, before the Persian Empire (approximately the sixth to third centuries BC) very little is known from any source about Greek, Roman and Egyptian history or the history of other nations; much rests on speculation and myths. Dates in secular history become more certain with the founding of the Medo-Persian Empire. For events before this time, Ussher relied solely on data from the Bible to erect his historical framework. He chose the death of King Nebuchadnezzar as a reliable date upon which to anchor all the earlier biblical dates. Working meticulously backward from there, he ended up with his date for creation of October 23, 4004 BC. Archbishop James Ussher was a highly educated and well-respected historian who devoted his life to defending the Christian faith. Ussher meticulously researched the secular accounts of history and found that the Bible correlated with them. Ussher dedicated several years of his life to compiling a history of the world from creation to AD 70. Now you ask: How did he get 4004 BC? Answer: He used the chronologies in the Hebrew text of Genesis 5 and 11, together with other Bible passages that we will consider. To simplify the calculations, Ussher ties the chronology to the final deportation of Judah in 584 BC. His detailed calculations cover over 100 pages in the original document. Nowhere in your Bible does it say that the day of creation was October 23. Because the Jews and many other ancient peoples started their year in the autumn, Ussher assumed there must be a good reason for it. He therefore concluded that God created the world in the autumn. After consulting astronomical tables, he picked the first Sunday on or after the autumnal equinox to begin the year 4004 BC. But the equinox occurs around September 21, not October 23. At least, it does now, thanks to some juggling of the calendar. In his research Ussher found that the ancient Jews and the Egyptians did not use the orbit of the moon (lunar calendar) as the basis for their year. Instead, their year was made up of twelve months, each thirty days long. At the end of their year they tacked on five days, and every fourth year they added six days. However, a year of 365 days is too short, and one of exactly 365.25 days is too long. They had to drop days from it every now and then to keep the seasons from drifting. When Julius Caesar reformed the calendar, he adopted basically the same system we now use, with twelve months of various lengths. However, even with his reforms, the seasons began to drift. By the 1700s the English calendar was off by eleven days. On September 2, 1752, eleven days were dropped from the English calendar to make the seasons start when they were supposed to. Another day was dropped in 1800 and again in 1900. These years would normally have been leap years, but instead were made normal years to keep the calendar in line. Today we use the Gregorian calendar, which is a refinement of the Julian calendar. Before Julius Caesar’s reform, no correcting adjustments were made to the calendar. When we consider the four thousand years between Caesar’s time and the time of creation, almost thirty-two days have to be dropped to make the seasons start when they should. By making these adjustments, Ussher arrived at the date of October 23, not September 21. However, when the Gregorian calendar corrections are applied to the Julian date of October 23, 4004 BC, we get the Gregorian date September 21, 4004 BC, which is the normal day for the autumnal equinox. Is there any way that we can verify Ussher’s date for creation? There is a passage in Amos that is quite interesting. Around 800 BC Amos made the following prediction in Amos 8:9–10 (NKJV): And it shall come to pass in that day, says the Lord GOD, that I will make the sun go down at noon, and I will darken the earth in broad daylight; I will turn your feasts into mourning, and all your songs into lamentation; I will bring sackcloth on every waist, and baldness on every head; I will make it like mourning for an only son, and its end like a bitter day. 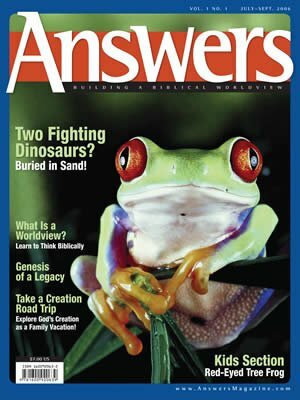 In a publication produced by progressive creationist Dr. Hugh Ross (who promotes the big bang, a local Flood, and age of the earth of millions of years and nonliteral days of creation, etc. ), a cartoon mocks Archbishop Ussher. It characterized him as a "dunce" because he proposed that God created the universe around 6,000 years ago, and the days of creation were literal days. But was he a dunce as Dr. Ross portrays? Many contend that the ancient Jews used a lunar calendar before the Babylonian captivity. If this is so, then Jewish feasts such as the Feast of Pentecost, the Feast of Unleavened Bread and the Feast of Tabernacles would occur about the middle of the month around a full moon. You can never get a solar eclipse when the moon is full! A lunar calendar would make the seasons drift by up to 30 days. Since the Levitical system was based on the agricultural cycle, you could very easily end up, in some years, celebrating the Feast of First Fruits after the entire crop had been harvested. At the other extreme, you might hold the feast before any crop was ready to harvest, which really makes a mockery of the feast. In order for this feast system to work reliably, you must follow the solar year so that the seasons start when they are supposed to and harvests occur about the same time each year. We have seen that Ussher had logical and historically valid reasons for arriving at the year, and even his proposed beginning date of creation. 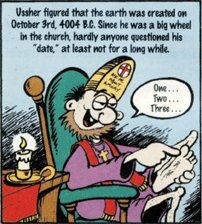 These were not wild guesses of some illiterate bishop counting on his fingers and toes, as progressive creationist Dr. Hugh Ross disrespectfully alleged in his organization’s cartoon (see inset). When we defer to the Bible as our authoritative basis for the areas on which it touches, it will prove itself without fail. In addition to the chronologies given in Genesis 5 and 11, Ussher used other large periods of time given in several places in the Bible. Below are these large periods of time that Ussher used in his calculations—without going into all the intermediate details as he did. ( Genesis 12:10 ; Exodo 12:40 ; Galatians 3:17 ) 2,083 yrs. ( 1 Kings 6:1 ) 2,513 yrs. ( 1 Kings 11:42 ) 2,992 yrs. ( Ezekiel 4:4–6 ) 3,030 yrs. 584 BC The Final Deportation of the Jews 3,420 yrs. Larry Pierce is a retired computer programmer who greatly enjoys ancient history. This passion led him to spend five years translating The Annals of the World from Latin to English. He is also the creator of a sophisticated and powerful Bible program, The Online Bible. For more information or to order The Annals of the World by Ussher, visit: www.AnswersBookstore.com/go/annals-of-world. 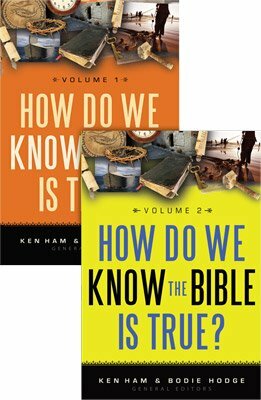 The Annals of the World(modern day translation) can be purchased from almost any Christian bookstore in the United States, or online at www.AnswersBookstore.com/go/annals-of-world. The Annals of the World, pp. 9, 75-76; see Diod.Sic.,I.1.c.50.s.2.1:177; Strabo,I.17.c.1.s.46.8:125; Strabo,I.17.c.1.s.29,8:85; Herodotus.I.2.c.4.1:279; Genesis 7:11,24; 8:3-5,13,14. Waddell, W.G, Manetho, 1:99, Loeb Classical Library, 1940. Ibid; see Childe, V. Gordon, New Light on the Most Ancient East, 1934, pp. 5f.